Sue Darby, the owner of Sue’s Tiny Costumes is an avid lover of dolls and especially small dolls. She has dressed and sewn for many dolls all her life but in 1996 found her love of miniature dolls while attending and competing in the Anaheim Doll Show. 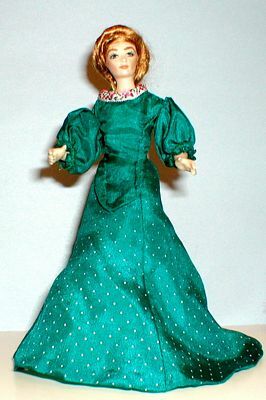 Her entry was the lovely 46″ lady doll Letha Marie who competed in the Sewing Division and placed 2nd. Letha’s gown was a Fashion Design Computer Aided Drafting assignment for her second year of college. The original assignment was to draw and draft a line of garments. Sue’s instructor allowed her to take this a bit further and applied it to a historic garment collection for her 46″ Letha Marie doll. The second part of the assignment was to grade (change the size of the pattern) to fit 2 other dolls. Sue took this whole thing to heart and chose to research and create a historic line of garments dedicated to her great-grandmother’s birth year 1889. She then designed, drafted and graded all 10 patterns with undergarments to fit 5 1/2″ Katherine and another doll named Gwendolyn who is 12″ . Sue learned a lot during this assignment about dolls and body types as Letha is a cloth body doll, Katherine is mostly porcelain and Gwendolyn is all porcelain. Letha and Katherine are both definitely ladies while Gwendolyn seems to be a ‘budding teen’. Doing this assignment which was for several classes earned grades of an ‘A’ in each. Sue went on later that same year to create the 19th century line and created several techniques that have come in handy for drafting and sewing in 1″ scale. Over the time she was in college Sue created many lines and most of them are or will be offered here. In late 2000 Sue discovered Small Stuff Digest and while ‘talking’ to many of the subscribers was encouraged to write about how she drafts in miniature and to market her removable costumes and patterns. Taking this encouragement to heart less than a year later Pattern Drafting for Miniatures was born. Due to unforeseen computer glitches the original file was lost but Sue retained her own copy and in 2002 painstakingly recreated it and also made some improvements. Sue also occasionally works with her mother, Shirley, of Shirley’s Creative Designs on various pattern drafting projects. It was during one of these projects that “Measuring a Lady Doll 101” was born which turned into the online Pattern Drafting Crash Course and has now become part of Pattern Making for Dolls. Sue has been a Pattern Consultant for International Doll Magazine and entered the Alaska State Fair placing 1st for her design of Little Bo Peep and her Sheep for Kitty Collier and Tiny Betsy. In 2006 Sue returned to school to seek a Bachelors in Business Management which was completed in 2009 with honors. During this time Sue’s Tiny Costumes was not updated but continued to provide the current stock of downloadable products. Sue graduated in 2009 with honors and is slowly looking at bringing the dolls back into her life in between a regular day job, kids, sweetheart and house projects. Any questions you have please do not hesitate to contact me! I always like to talk to others online!